When we think of air pollution and the health issues it may trigger, many of us think of coughing, wheezing, and other breathing difficulties. While these are certainly very real and dangerous effects, air pollution may be harming us, and our children, in more ways than we may have imagined. Along with the potentially devastating physical effects of air pollution, a new study performed at Umeå University in Sweden and published in BMJ Open has linked air pollution to psychiatric disorders in children. For their study, researchers analyzed approximately half a million children and teens under the age of 18 across four major counties in Sweden. The data was collected between 2007 and 2010. Researchers noted various medications for mental health disorders that were prescribed to these children. These included antipsychotic drugs, sleeping aids, and sedatives. The researchers then compared this data to the levels of nitrogen dioxide (a gas emitted by vehicles) in the areas where the children and teens lived. Results of the analysis found a correlation between higher air pollution and the risk of children being prescribed meds for one or more psychiatric disorders. While more research needs to be done on this, it does seem that vehicle emissions may pose some serious dangers to developing minds. Many teenagers, and even many young children, spend WAY too much time staring at screens nowadays. All of those hours can lead to insufficient sleep, and a whole lot of sitting around, which is dangerous for both the body and the mind. Much of this screen time centers around social media. Too much time spent on social media sites has been linked to mental health issues including anxiety and depression, as well as lowered social skills. Related to the issue of screen time is the issue of bullying. This isn’t just done in school hallways and bathrooms anymore: as we all know, it often takes place online. When kids are bullied, their self-esteem may take a huge hit, and the bullying may pave the way for insomnia, anxiety, depression, and more. Did you know that some health experts have equated the dangers of sitting for too long with the dangers of smoking? Between classroom time and screen time, many kids are sitting around for hours on end, which may lead to depression. Let’s face it: many beloved children’s foods are chock-full of sugar. Added sugars may lead to depression, anxiety, mood swings, and cravings for more sugar. While many parents use it to reward their children, this system requires some revamping, because why reward kids with something that can harm their physical and mental health? Along with sugar, other packaged foods, including those that contain processed carbohydrates and trans fats, may lead to anger and other mental health disturbances. So, what can we do to help our kids thrive, and reduce their risk of developing mental health issues? Taking an active role in our children’s lives is a huge part of this. Engage them in active quality time, away from screens. This nourishes both their bodies and their minds, as well as your relationship with them. Cook healthy meals with your kids whenever possible, to give them both an appreciation for real food, and the skills to prepare it. As far as air pollution, choosing a green commute whenever possible is a start, but doesn’t solve the problem. Until more and more communities come together to really start reducing carbon emissions, polluted air poses hazards to all of us. This is something we as a planet really need to take seriously, and address on a large scale. Next articleIs Wildlife Tourism A Good Thing Or A Bad Thing? Hey Buddy!, I found this information for you: "Air Pollution And 4 Other Things That Threaten Mental Health Of Kids". 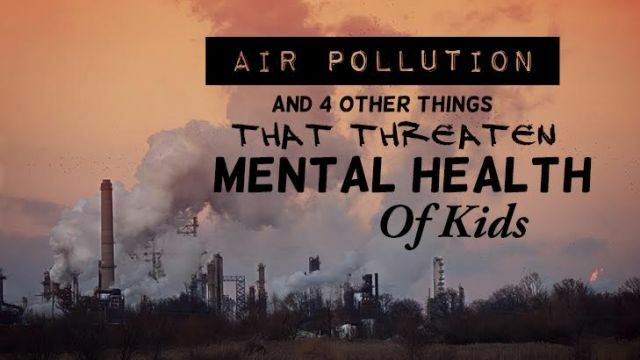 Here is the website link: https://www.thealternativedaily.com/air-pollution-and-4-other-things-that-threaten-mental-health-of-kids/. Thank you.